Here at The Fabric Fox we have been getting super excited for Christmas this year and I have been busy making lots of decorations to put up around the house to fill it with colour! I was looking at our Christmas fabrics and this one particular Cotton+Steel fabric really inspired me. It gave me a great idea to cut it out and make it into Christmas bunting! I have come up with some ideas on how you can make your own Christmas jumpers bunting using your favourite Christmas fabrics. 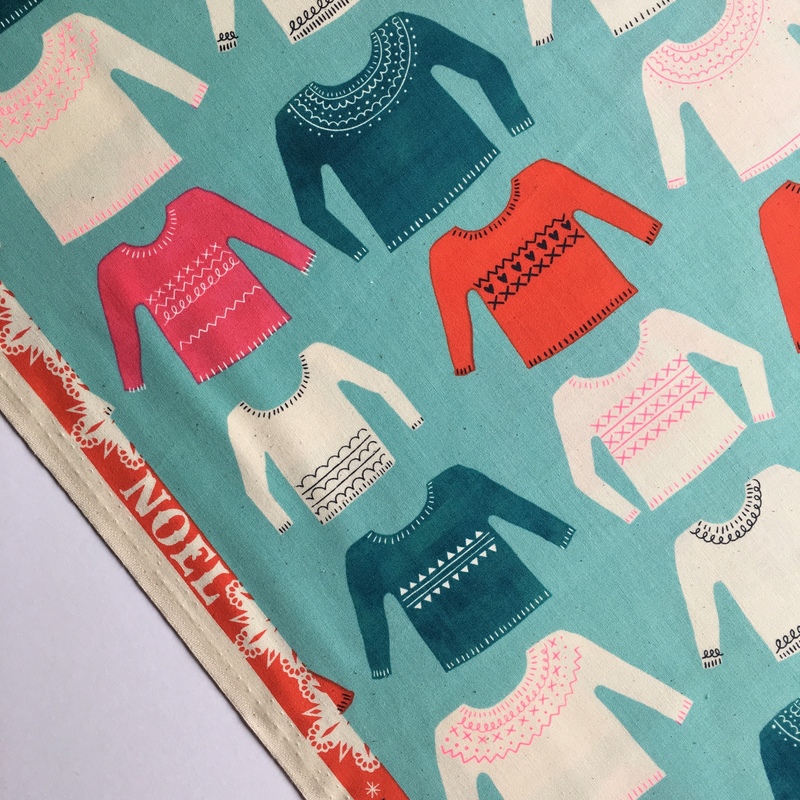 So I started my bunting by cutting around the jumpers from this undeniably fun fabric called 'My Favourite Sweater Aqua' from the Noel collection by Cotton+Steel. The jumpers are a few different shapes and sizes and they're not too neat or symmetrical, which I like. As these jumpers are only in a couple of colours I wanted to add a bit more variety to my bunting so I traced round one of the jumpers I had already cut out and made a paper template (you can always draw your own jumper template from scratch too). I used the template to cut out more jumpers from other fabrics from the Noel collection to mix in. Wearing funny and (let's face it) ugly Christmas jumpers with pride is a trendy Christmas tradition these days, so make your Christmas jumpers bunting stand out by incorporating some of your favourite fabrics. You can be really creative when picking which fabrics to use as it is a great opportunity to do some fussy cutting. 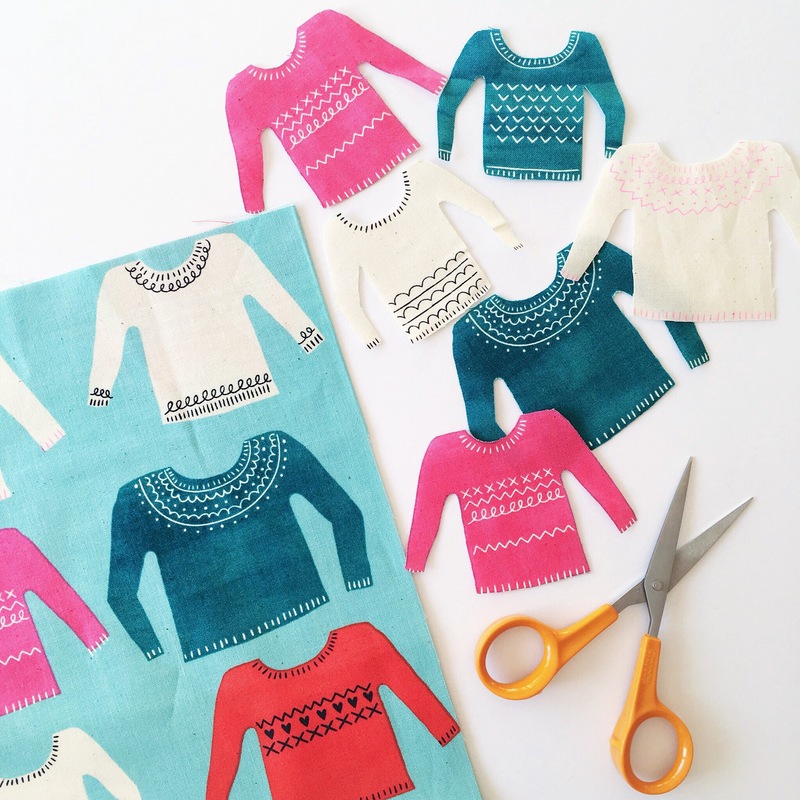 If you haven't heard of 'fussy cutting' before it's exactly what it says on the tin! It's when you carefully position your template and cut out some fabric that has a particular design you want to feature rather than randomly cutting from any piece of the fabric. Another way you can personalise your jumpers is with hand embroidery. 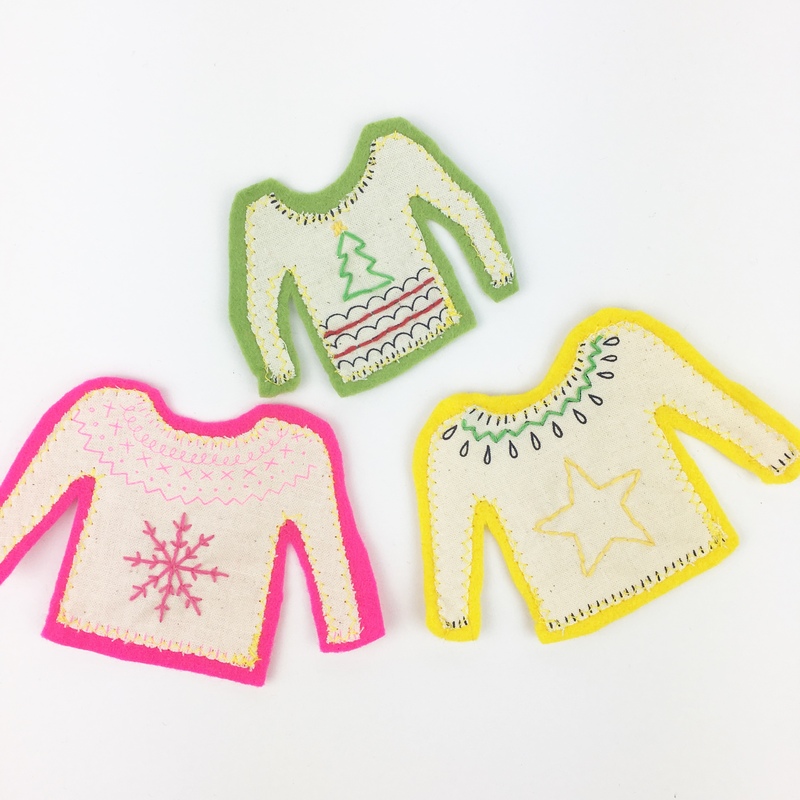 I stitched some simple Christmas motifs onto my jumpers and there's no limitations on your creativity with doing this because you can literally embroider anything you want! One cool idea you could do is stitch a letter on to each jumper to spell out 'Merry Christmas', or any other phrase you like! Hand embroidery is the best way to transform plain, simple fabrics into bold, exciting ones. 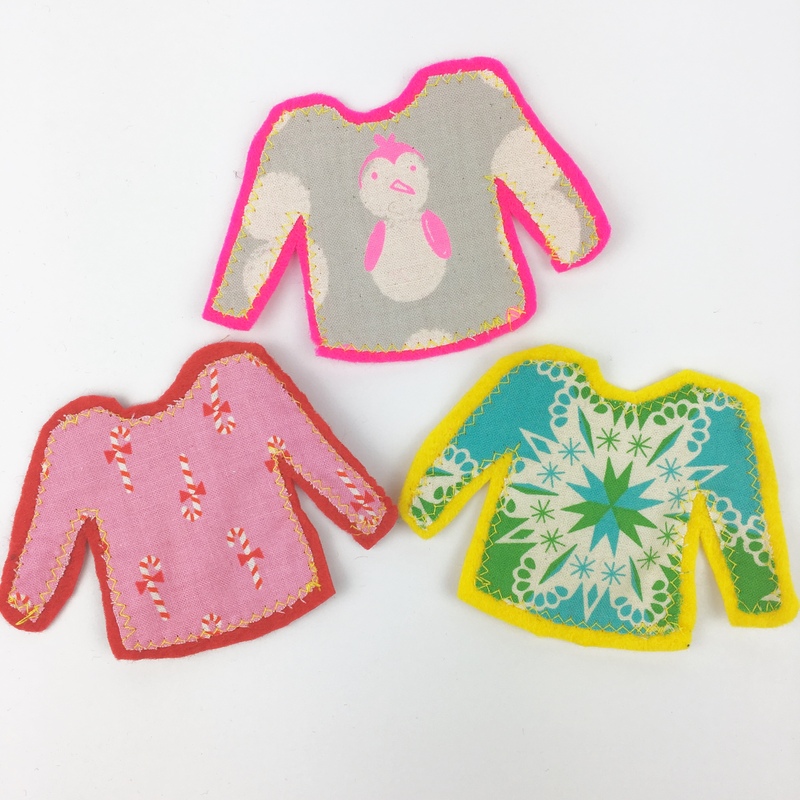 Once you have cut out all of your jumpers and customised them you will now need to attach them to some felt. I chose a variety of contrasting colours and pinned the jumpers onto the felt and cut around each one so you can still see a bit of the felt colour around each jumper. I then used my sewing machine to zig zag all the way around the edge of the jumpers to secure them to the felt. Using a zig zag stitch helps to stop the fabric from fraying. If you don't have a sewing machine this step could be hand sewn or you could use some fabric glue to secure the fabric to the felt. I then attached my finished jumpers to some string using mini wooden pegs. I thought this was a really fun way to attach them as they look like they are hanging from a washing line. I bought my pegs from the pound shop so they're quite cheap but super effective. If you don't have any pegs you can always stitch the string/ribbon onto the jumpers. 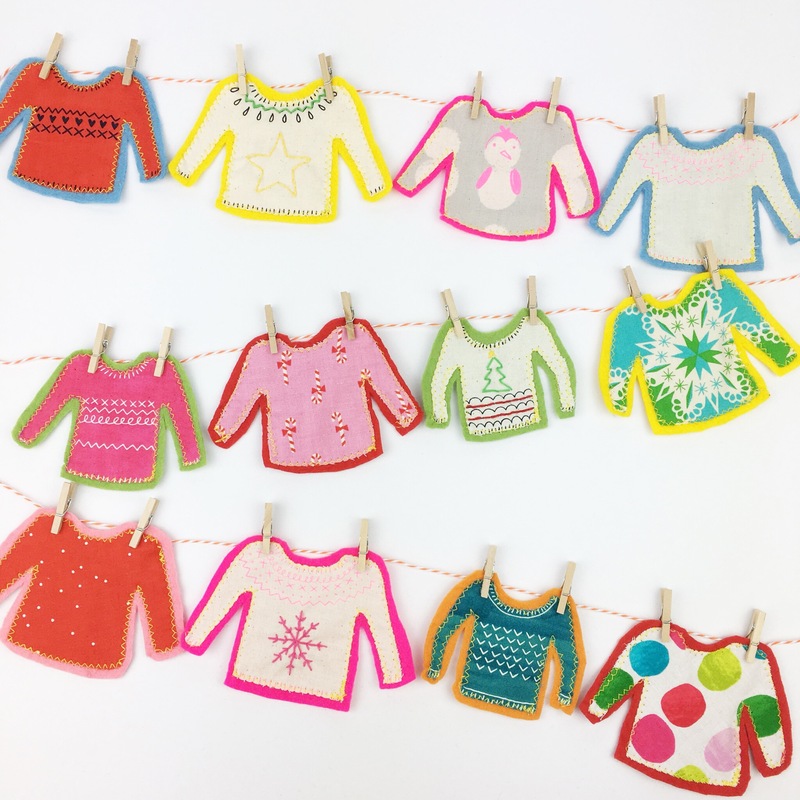 Making Christmas jumper bunting is the perfect way to make something personal with children or a sewing buddy! It's fun, quick and easy and there's no rules to play by - let your imagination go wild and make your home look beutiful in the process!